Make it possible to merge only a few adjustment layers into the base layer at a given time. Currently, if a layer has adjustment layers, it is only possible to collapse the all of the adjustment layers into the base layer at one time. It would be nice if a user could select some subset of the adjustment layers to merge with the original layer at a given time. If would be nice if you could merge, say, A and C without destroying or applying B. -base layer with layers A and C merged into it. You already can, just select the layers you want to merge, then merge those. BUT that may not preserve the appearance because you're changing the order of the math applied to the layer. Yes, you can, easily. But, again, it may not give the same appearance because you're changing the order of the math. I swear to goodness.... you can not. Maybe this is a Mac .vs Windows thing? Either you aren't explaining what you are trying to do very well, or you're missing the obvious. You can merge any set of layers you wish. But, again, it may not preserve the appearance because you're changing the order. I believe I explained myself poorly. I believe, what I was referring to as a "adjustment layer" was for my explanation actually a "clipping group "
I see exactly what's going on. 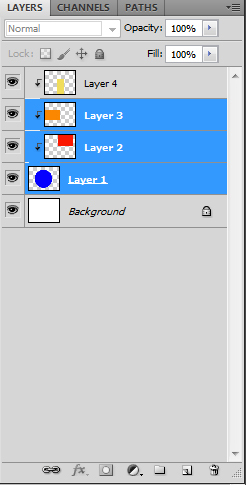 In Photoshop, when you have more than one layer selected, the top-most layer has the distinction of being the "Most-Selected-Layer" - meaning that when the layers are merged, they are pushed into the "Most-Selected-Layer's" slot (and inherit that layer's name and properties). In this case, it becomes a no-op because the layers that are clipped wouldn't have a layer to be clipped to anymore. The workaround is to select "adj layer C" alone and hit ctrl + e to merge down. Then change the z-order so "adj layer A" is directly above the base layer and hit ctrl + e to merge down. Thanks Jeffrey for validating my use case, and the work-around you suggested is solid as one is usually trying to merge the adjustment layers directly above into the base while keeping the higher adjustment layers intact. To have a one-operation solution for the specific use-case I presented would require a fix. With this configuration, CRT+E does nothing at all. Maybe I should have posted this in the "Bugs" section? Again, that condition is a no-op because the top layer is the most selected per my explanation above. The only way to do what you want is with a single layer selected to merge down into layer one. I know Jeff, but we still haven't convinced Chris. It's your terminology. It has nothing to do with Adjustment Layers. It's a clipping group issue. Good Point. Thanks for helping me to refine my terminology.